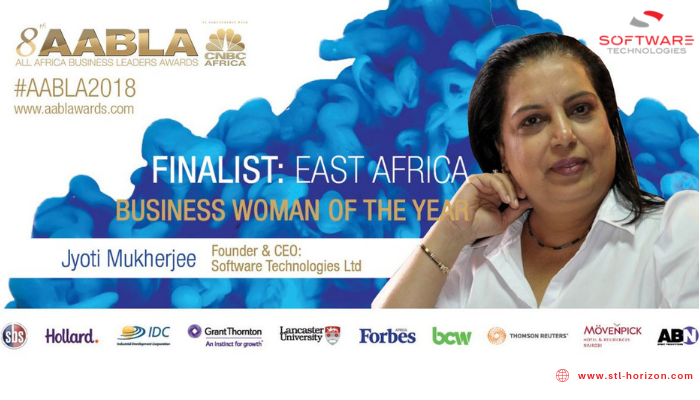 Software Technologies Ltd, Chief Executive, Jyoti Mukherjee was named a finalist for the Business Woman of the Year at All Africa Business Leaders Awards (AABLA) 2018 in a gala dinner held at Movenpick Hotel, Nairobi on Thursday, 13th September 2018. The All Africa Business Leaders Awards (AABLA™) in partnership with CNBC Africa honours remarkable leadership and salute game changers of business on the continent for their continuing commitment to excellence, developing best practices and innovative strategies. Jyoti was among three other finalists from Kenya; Joanne Mwangi – PMS Group, Jane Mgige Kenya – Flower Council and Joyce Gikunda – Lintons Beauty, who were nominated for the Business Woman of the Year from East Africa Region. The Business Woman of the Year nominees were vetted by judges based on exemplifying outstanding leadership in business. Other considerations in the vetting process include: achieving positive financial results, increased shareholder value and providing sound management, proven corporate governance, demonstrating innovation, best business practices and accountability, together with intangible qualities such as integrity and vision. The award ceremony was dominated by Kenyans who took up half of the 24 slots available with finalists being picked from a range of industries. Among the Kenyans who made it to the finalists include Group, Barclays Bank CEO Jeremy Awori, Marini Naturals Founder and CEO Michelle Ntalami and Dr. Joyce Gikunda, Lintons Beauty founder.